First published in 1963, Advances in Parasitology contains comprehensive and up-to-date reviews in all areas of interest in contemporary parasitology. 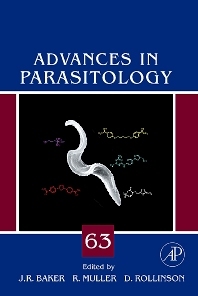 Advances in Parasitology includes medical studies on parasites of major influence, such as Plasmodium falciparum and Trypanosomes. The series also contains reviews of more traditional areas, such as zoology, taxonomy, and life history, which shape current thinking and applications. Eclectic volumes are supplemented by thematic volumes on various topics including “Remote Sensing and Geographical Information Systems in Epidemiology” and “The Evolution of Parasitism – a phylogenetic persepective”. Royal Society of Tropical Medicine and Hygiene, London, U.K.
London School of Hygiene and Tropical Medicine, U.K. Professor David Rollinson is a Merit Research Scientist at the Natural History Museum in London, where he leads a research team in the Wolfson Wellcome Biomedical Laboratories and directs the WHO Collaborating Centre for schistosomiasis. He has had a long fascination with parasites and the diseases that they cause, this has involved him in many overseas projects especially in Africa. He is on the WHO Expert Advisory Panel of parasitic diseases, the editor of Advances in Parasitology and a former President of the World Federation of Parasitologists. His research group uses a multidisciplinary approach, which combines detailed molecular studies in the laboratory with ongoing collaborative studies in endemic areas of disease, to explore the intriguing world of parasites in order to help control and eliminate parasitic diseases.